In the last post I wrote about medieval castle gardens making a special feature of Berkeley Castle. That, however, was not the first time I have written about medieval gardens. Back in 2008, I listed a number of castle gardens. These included Arundel Castle, Leeds Castle and Naworth Castle. The latter not only has a beautiful castle garden (sadly not open to the public) but also some wonderful woodland including an historic tree. 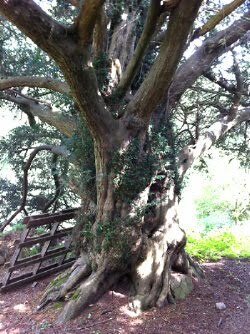 It is a yew tree believed to be at least 750 years old - which makes it a medieval tree. Now I'm sure there are plenty more medieval trees out there but this is a first for me so I was very excited to be able to take this photograph. Looking at the tree close up there is a definite sense of tangible history about it. Just think what events in world history have happened during that tree's lifetime so far ... from the Battle of Stirling Bridge in 1297 where William Wallace defeated the English army of King Edward I, to the birth of Da Vinci in 1452, to the English Civil War 1642-1651 ... and more. This is a yew tree with truly historic roots (pardon the pun! ).